Every artist has his source of inspiration. Cezanne was drawn to the French countryside. Picasso painted the beautiful women he fell in love with. 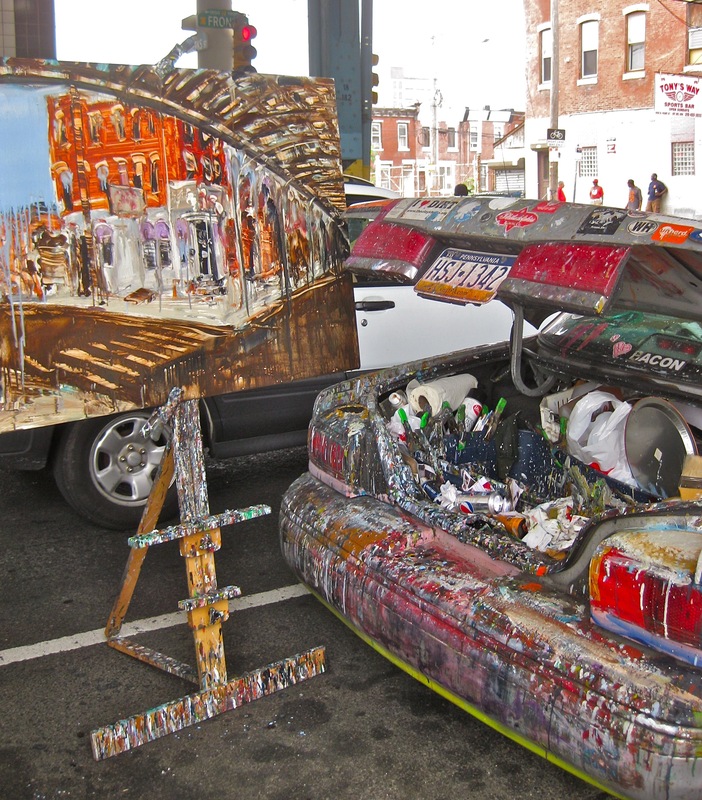 Local artist David Ohlerking’s muse is the city of Philadelphia. If you live in Fishtown or Kensington you’ve probably seen David Ohlerking painting on the street. If you’ve seen David, you’ve seen his car, or rather his studio. All of his supplies are right in the trunk, including several jars of paint. As he travels throughout Philadelphia to paint different parts of the city, David attracts many curious spectators. He even lets a few of them try out his paintbrushes. However, only the most gifted and natural artists among them get the chance to participate—little kids. 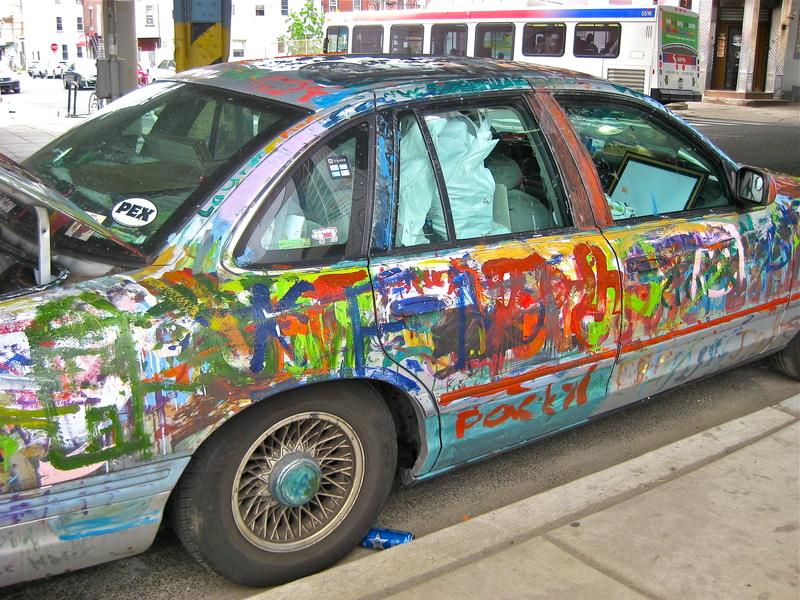 David offers his Ford Crown Victoria as a free-range canvas to young creative spirits. As a result it has become a work of art in itself. Layered with colorful brushstrokes and splashes of paint, the car is a traveling exhibition for everyone to see and enjoy. Like the children he lets paint his car, Ohlerking embraces the power of spontaneity in his work. 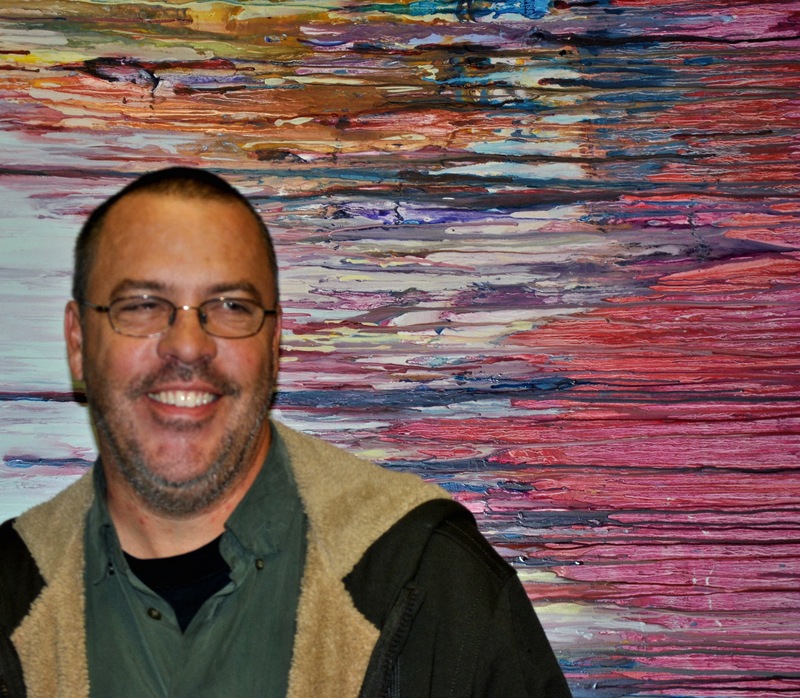 His style is energetic, fluid, and full of movement, giving a vibrant personality to the city. Buildings and streets take on a new life, and seem ready to leap off the canvas. In our interview you’ll get an insight into the philosophy and process behind David’s paintings, and why he is one of the most original artists in Philadelphia. What are some important events in your life? I grew up traveling a lot with my family. We spent time in the Philippines, where my dad was a missionary, and in Belgium, which is full of art history. I loved the icons in the Russian Orthodox churches there. I studied art and philosophy in college, but dropped out and became a musician for ten years. Then I got a job as a receptionist, and studied art history while on the computer. I sent my paintings to Alex Kanevsky, an artist from PAFA, and he offered to critique them. He told me what was working and what wasn’t. I took everything he said like it was the Bible. At the time I had a little gallery in Austin, Texas, but eventually moved here to Philadelphia. I love the town and I’m happy here. What was the transition like from music to art? I’ve always felt that art was a little part of the world I could take charge of. In a band you’re dependent on a bass player or a drummer, which can screw things up. With art it’s just you and the painting. It’s your space, your speed. If I have a painting I don’t like, I don’t work on it or go back to it. There’re no hurt feelings. I made a lot of mistakes in the music business, and I learned from those mistakes in becoming an artist. I realized how important it is to include as many people as you can in what you’re doing. Don’t try to keep everything to yourself, and don’t try to control the goodness that’s coming to you. Let it out. What is your method and approach to painting? My trunk is my studio. It’s full of jars of paint, and they don’t dry up because I paint almost everyday. I usually drive around until I find a street I like, then bust out the easel and set up. I paint directly, all in one take. There’s not a lot of pondering. I don’t try to get it right, I get into the painting and let it happen. When I paint buildings it’s not about architectural rendering. It’s about how something seems to me at that moment and my reactions to it. I used to be very careful in my work and would follow certain rules, but now I paint loosely. My teacher, Alex Kanevsky, has paintings that look tight and neat from far away, but if you get up close they’re messy. A bunch of dumb brushstrokes can add up to a smart painting. How did your car evolve into a work of art? I was painting a church on Thompson Street, and there were a bunch of crazy little kids who wanted to help me paint. I’ll usually let kids help me to a certain point, because the way I paint looks like a kid anyways. But this time it got out of hand. I had paint all over my back bumper, so I asked if they just wanted to paint the car. Man, they were all over it! They painted every part they could get to. At first I only let kids at the church paint the car, but now everyone gets to paint it. The only rule is that they can’t be in junior high yet. It’s awesome having a weird car. People wave and give me thumbs up all day long. It makes kids so happy. Why do you restrict the age of who gets to paint your car? Little kids paint better than we do. They do things you shouldn’t do as an artist, and it looks cool. Four year olds are the most magical artists. They have a love for paint and the activity of paint. They exist exactly in that moment when the paintbrush hits the car. Artists can get into abusive relationships with paint where they try to rough it up. Little kids are the opposite because they take so much joy in it. My teacher always talks about the importance of a beginner’s mind. When I’m painting I try to be like a little kid, and I want my arm to feel as joyful as a little kid’s. 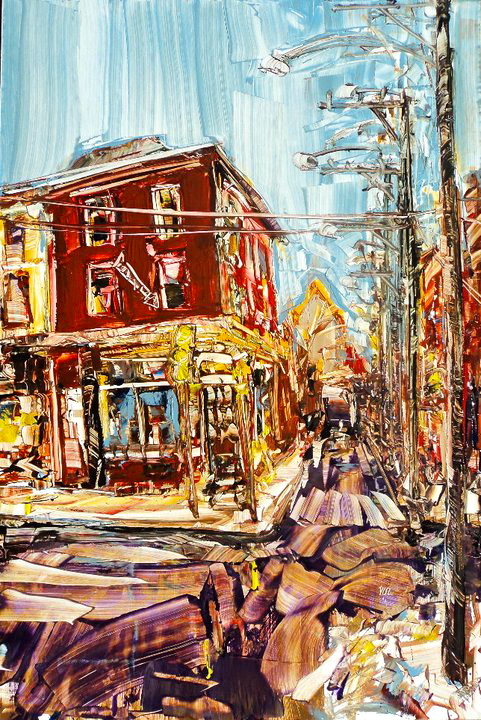 What do you enjoy about being an artist in Fishtown? The neighborhood matches me personally. I like that they’re trying to make this place friendly to art. When I was in Austin, I would paint on the street with Chris Chappell, my friend and fellow artist, and people would stop and wonder what we were doing. In Philadelphia painting on the street is nothing. There’re tons of artists here. It’s funny, I just drove across the U.S. and back, through Las Vegas and all these cool places, and I was so happy to get back here. It’s a beautiful town with a lot of history, mixed up with different cultural groups: Ukrainian, Irish, Puerto Rican. I like to talk to the guys who’ve been here a while, who know what Fishtown was like a long time ago. I’m an interloper here, so it’s fun to have people let me in their world like that. Visit http://davidohlerking.com/ to see more of David’s work. © Steven Sparber and Fishtown Spotlights, 2012. All rights reserved. This entry was posted in Art, Categories and tagged alex kanevsky, david ohlerking, fishtown, PAFA, philly arts, rocket cat cafe by fishtownspotlights. Bookmark the permalink.